Yesterday it was eleven congressional Republicans, today it’s DOJ Inspector General Michael Horowitz who issued a criminal referral for former FBI #2 Andrew McCabe. 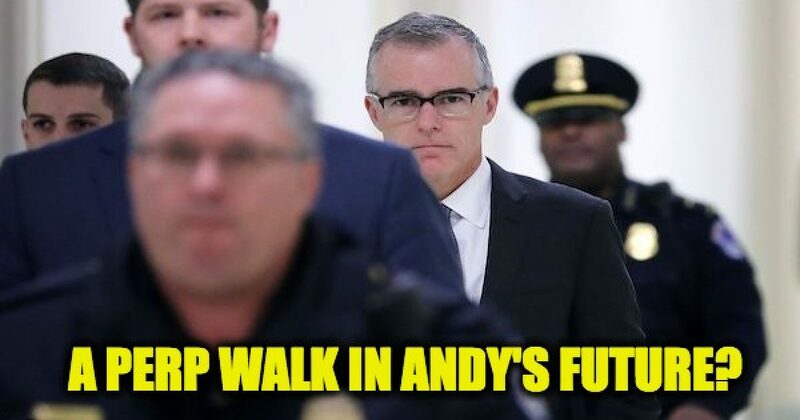 Per CNN, Horowitz sent a criminal referral regarding former Andrew McCabe to the US attorney’s office in Washington, according to a source familiar with the matter. McCabe’s spokesperson, the Justice Department and the US attorney’s office all declined to comment, which kind of makes sense because one of the matters McCabe got in trouble for was leaking the details of an investigation. While the CNN report didn’t specify what the IG wants McCabe charged with, based on the report issued last Friday there are choices as McCabe lied—a lot. The Inspector General found McCabe had lied at least 6 different times about major issues. In particular, the IG found that McCabe lied to cover up his leaks. McCabe tried to blame his on his subordinates before realizing that he’d already been found out, and finally confessing to being the leak… before blaming it on Comey who he says “authorized” the leaks. Comey, another leaker/liar doesn’t remember the conversation. And who knows what Horowitz has found out in his other investigation, like what was McCabe’s role in using the unsubstantiated Steele dossier to get the FISA warrant? What was the anti-Trump “insurance” the FBI lovebirds Peter Strzok and Lisa Page discussed with McCabe? Strzok texted to Page on Aug. 15, 2016. And of course, did McCabe “obstruct justice” in the Hillary Clinton investigation. McCabe led the Clinton-related investigations until the week before the 2016 election. Only then did he “recuse himself” after a Wall Street Journal article about donations linking Hillary Clinton to McCabe’s wife. While it is doubtful that the Congressional Republicans’ referral will amount to anything, an Inspector General’s referral carries more weight. Folks this is going to get real interesting.